17 inch Skillet Since 1896, the Lodge family has been casting premium iron cookware at our Tennessee foundry. As the sole American manufacturer of cast iron cookware, we are proud to carry on the legacy started by our great grandfather Joseph Lodge. We don`t just make products; we make heirlooms that bring people together for generations. At home in the backyard, the backwoods, or the ballgame. Brutally tough for decades of cooking. 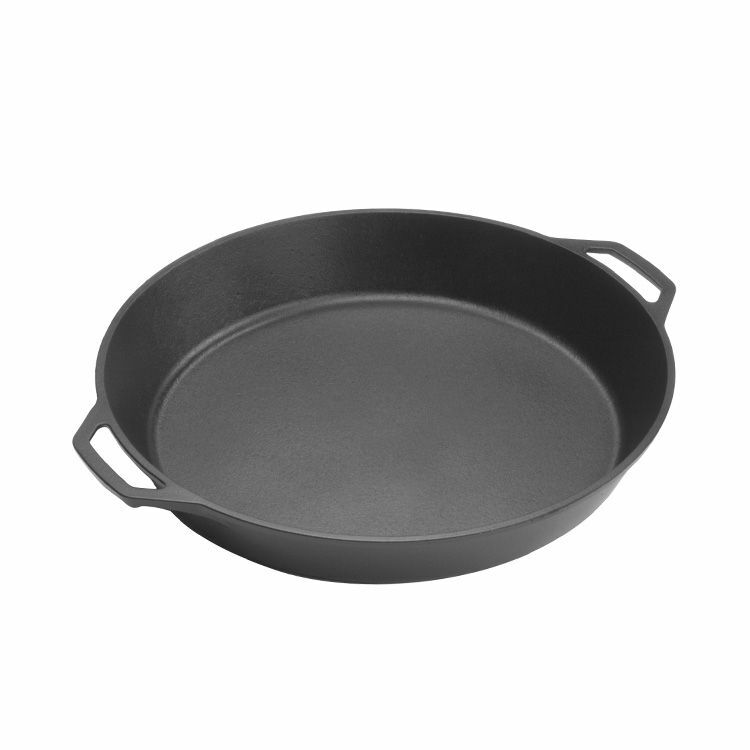 17 inch Skillet is rated 4.9 out of 5 by 26. Rated 5 out of 5 by ABW from Gave to my son as a birthday gift! He... Gave to my son as a birthday gift! He loves it and now can cook steaks for his family of four in one pan. This tracked gift arrived as expected! Great buy! Rated 5 out of 5 by Tom from Great skillet. Made in America. Great price! Perfect for the... Great skillet. Made in America. Great price! Perfect for the large quantities we prepare at our family gatherings. Rated 5 out of 5 by Ang from Heavy duty and comes preseasoned! Love this skillet! I have baked in it, stovetop, and grilled ... Heavy duty and comes preseasoned! Love this skillet! I have baked in it, stovetop, and grilled in it. Works well with any cooking method. Really love cinnamon rolls in it! Had a little issue with bacon and eggs sticking when new, but it is finally getting seasoned enough. I use the Lodge 100% Canola Oil to season it. I load it with water as soon as I can after cooking and use the brush to clean the food off the bottom, let it sit until it cools, wash, dry immediately and then season it. Works out great for me. Super easy to clean that way. Happy Cooking! Rated 5 out of 5 by Anonymous from Excellent cast iron pan for the price. It is massive!... Excellent cast iron pan for the price. It is massive! I will use it on the stove and in my Big Green Egg grill. Rated 5 out of 5 by Michael from Perfect for large poultry cooks!... Perfect for large poultry cooks! Rated 5 out of 5 by RH from Lodge brand is quality made here in the USA! This... Lodge brand is quality made here in the USA! This the largest Dia. pan the WEIGHT goes up accordingly, be sure you NEED the large pan! Makes a great broiling pan or making deep dish pizza just preheat pan first! Use a GrilleDaddy steam brush to clean method! Store pan in bottom drawer of oven, fits! Rated 5 out of 5 by Jack from As the owner of 16 other pieces of Lodge cast iron utensils, I really like their natural non-stic... As the owner of 16 other pieces of Lodge cast iron utensils, I really like their natural non-stick qualities. I’ve been using cast iron for 20 years now. I have 4 skillets in various sizes with my largest being the 13 ¼ “. That one is capable of holding 5 to 6 pieces of breaded fried chicken, however, there were occasions where that wasn’t large enough so I purchased this 17” skillet. I was able to fry 12 pieces of chicken all at once in it on my natural gas permanent post BBQ grill. The grill surface is large enough to heat this large skillet evenly with no hot and cooler spots which can cause uneven cooking. Having 2 loop style handles makes handling the skillet easy. I’ve read negative reviews in regards to using cast iron because of food sticking. You have to remember that cast iron is a cooking utensil, NOT a storage vessel. One person stated they placed the cast iron skillet in the refrigerator with the leftovers in it and not only did the food stick, the skillet started to rust. This is not the correct way to use cast iron. After finishing your meal, remove all the food from the utensil and place leftovers in a proper storage vessel. Rinse the cast iron in very hot water (NEVER USE SOAP) using a brush to remove any residue. Then fill the skillet with more hot water and bring it to a boil. Run a brush in it again and then dump the water out. Dry the skillet, and while it’s still very hot, coat the inside and outside with Crisco solid vegetable shorting. It’s now seasoned and ready to use again.